People who love kids are a special breed with lots of patience and huge hearts. If you love children, you may even decide to pursue a career that caters to them. The problem is, it can be difficult to find positions that pay well when dealing with children. But, that does not necessarily mean you are confined to low-wage work. According to the Bureau of Labor Statistics (BLS,) there are a number of moderate- to high-paying jobs for people who love working with kids. If you think you’re one of those kindhearted, patient folks, check out some of these lucrative job options. A bachelor's degree in nursing is required to become a licensed pediatric registered nurse, or RN. Job duties include providing and coordinating patient care along with education and information about health, wellness, and disease management. Pediatric nurses also provide physical care and emotional support for their young patients during their medical treatment. Pediatric nurses can work for hospitals, physicians’ offices, or home health care services. They can also work in schools, clinics, or within the military. Pediatric nurses may work in different disciplines like oncology, cardiology, or neurology, but will focus on administering services to children. According to the BLS, 2016 median pay for registered nurses stood at $68,450. Pediatric dental hygienists work alongside dentists and perform duties like teeth cleaning, exams, and providing patient education on oral health. A hygienist must have an associate degree and be licensed to practice. Typical dental hygienist programs take up to three years to complete. As a pediatric dental hygienist, you’ll work with dentists who specialize in caring for patients under 18 years of age. At times, children can be anxious when it comes to visiting the dentist’s office, so you should be prepared to soothe their fears and provide a pleasant experience for them. In 2016, dental hygienists earned a median salary of $72,910. A speech language-pathologist, also known as a speech therapist, evaluates and diagnoses people with speech issues while also providing and carrying out a plan to resolve these issues. This career lends itself to early intervention around speech and communication deficiencies. Because it’s best to start treatment as soon as a speech problem is noticed, these professionals often work with kids in their formative years. There are adult-onset speech deficiencies, but the BLS reports that as many as two of every five speech therapists work in schools. Most speech pathologists have master’s degrees, and some states require therapists to be licensed to perform speech therapy services. The 2016 median pay for this profession was $74,680 per year. Child psychologists work with young individuals in many settings to diagnose, evaluate, and plan care for emotional, cognitive, and social disorders. Some child psychologists work in school settings as a counselor or have a private practice that focuses specifically on the needs of children. Duties for this job include observing, interviewing, and studying individuals to help modify behaviors that lower their quality of life. Licensed psychologists are typically required to earn doctoral degrees in the field. The median salary for psychologists in 2016 was $75,230 per year. Juvenile justice attorneys defend minors who’ve been convicted of a crime. Working with kids in the legal system may require soft skills like empathy, active listening, and compassion. A juvenile justice attorney may also have to be familiar with related disciplines like social work, counseling, and mediation. Most juvenile justice attorneys have private practices, but some are employed by government entities and nonprofit organizations. Attorneys that work with minors have to meet the same requirements as any other lawyer: three to four years of law school, a law degree, and a passing score on the bar exam for the state they’ll be practicing in. According to the BLS, lawyers earned an average $118,160 per year in 2016. The demand for dentists in general is expected to grow 17 percent over the next 10 years, which is much faster than many other occupations. If you enjoy working with children, a career as a pediatric dentist may be a good fit. Dentists must attend an accredited dental school and pass written exams to become licensed. Since pediatric dentists specialize in certain issues that only arise with younger patients, many of them open practices that provide services solely to children. Dentists earned an average $159,770 in 2016. Pediatricians can be family doctors who also practice pediatric and internal medicine. These doctors perform routine wellness checkups, and treat and diagnose injuries or illnesses in child patients. Physicians must have a bachelor's degree in some area of undergraduate study, plus another four years of medical school. Depending on their specialty, they will have to complete an additional three to seven years of internship and residency programs. Physicians earned an average $208,000 per year in 2016. Working with children can be a rewarding, positive experience. Being well-paid to work with them can be the icing on the cake. 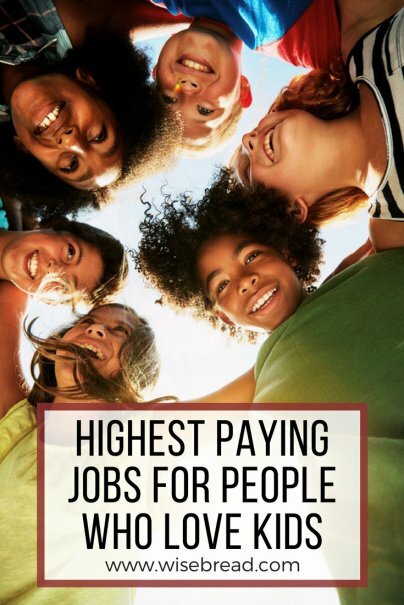 If you love kids, you’d do very well to work in one of these high-paying careers.